“That’s Butterfly” derives from the international exhibition “That’s Opera”, that opened in Brussels on November 13th 2008 and lasted for four months. Thanks to a very innovative and creative idea, for the first time attention will be focused on the main character of an Opera. 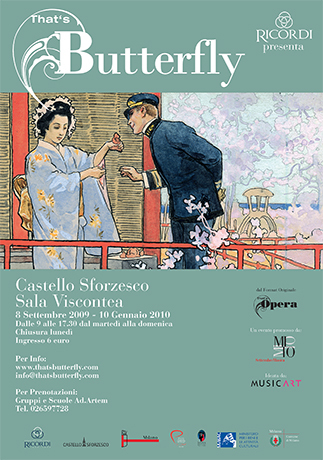 Madama Butterfly doesn’t live just in the setting of the Opera, she is also the core of an exhibition where the background is founded on never seen before precious exhibits of the Ricordi Historical Archive Visitors will admire the handwritten score of Puccini’s Opera, the original letters, photographs and watercolours related to the “mise en scene”. Thanks to videos and other multimedia and interactive elements, this exhibition will be characterized by a high education and entertainment value. The exhibition will be divided into 5 areas which reproduce the steps of the creative process of staging an Opera: Libretto, Partitura, Scenografia, Costumi, Rappresentazone. The Italian names have been kept as they are adopted by the musical sector worldwide.